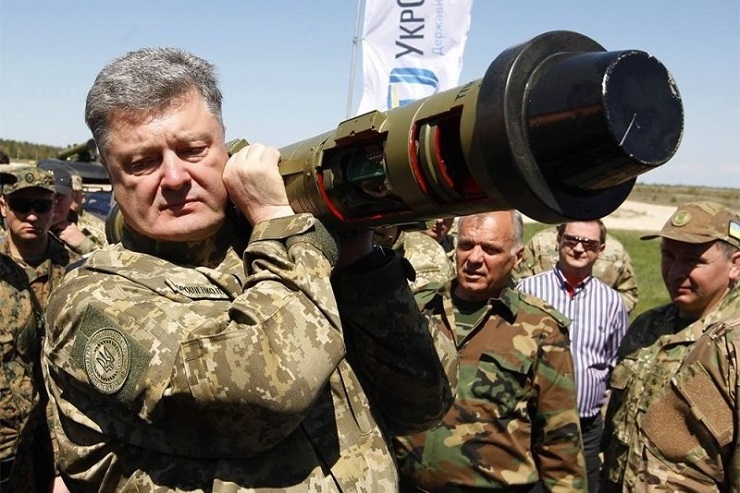 After being shipped a phalanx of advanced Javelin anti-tank missiles, Ukraine’s oligarch-dictator Petro Poroshenko wasted no time preparing for an offensive against pro-Russian fighters in the Donbass region. Hours after the announcement the U.S. weapons had reached Ukraine, think tanks and analysts began mulling over Poroshenko’s redux military mission against separatists. On April 30, 2018, the same day the U.S. missiles created a media wave again, Ukraine’s “antiterrorist operation” in the eastern region of Donbas officially ended. In place of a long-awaited resolution to the Donbass stalemate, the Porosenko junta reshuffled the deck renaming the war on the pro-Russian citizens in the East a “joint forces operation.” My colleagues in Russia, America, and in the EU are now afraid of a full-scale assault which would inevitably escalate out of control. The Minsk Protocol and Minsk II seem like faint and far off echoes of negotiated peace today. Here’s why. The so-called “antiterrorist operation” (ATO) which Poroshenko used to pummel separatists and civilians alike in the Donbass was intended to be a short-lived operation to smash the relatively puny force made up of Donbass fighters and volunteers. But when the carnage gripped the world, and when those outnumbered fighters held out under the Poroshenko regime’s onslaught, the “big boys” stepped in to broker a tentative ceasefire. Now, with a booster shot of money and weapons from the Trump Administration, it seems clear the war on the frontier will be reignited. But my Donbass colleagues have been ready for this all along. What’s more important for all Ukrainians is Poroshenko’s wider ambitions. You see, the biggest difference between the terrorist operation (ATO) and the joint forces operation has little to do with semantics. With the instigating of the JFO Poroshenko is ceasing tighter control over all of Ukraine. Pay close attention. The previous operation was run under the auspices of the security force, the SBU. Now, the new operation will be primarily under the control of the armed forces, which are wholly controlled by the Commander in Chief, Petro Poroshenko. Furthermore, regional and local police, the SBU, the National Guard, and the Border Guard Service will now be utilized under the presidential command structure. So, a nation whose people have suffered more than any of the former Soviet republics of late is somehow the hub of humanity and capable of hosting extravagant sporting events? The reader must know, that Ukraine’s current economic freedom score is 51.9, making its economy the 150th freest in the 2018 Index just behind West Africa’s Cameroon. Even Costa Rica, the place where they really grow the best bananas, site almost 100 positions ahead of Ukraine. But let’s return to our war footing analysis. In an article May 3rd, the Atlantic Council’s Anders Åslund declares “Ukraine Is Worth Fighting For” – enumerating all the value European and American soldiers may want to kill and die for soon. The syrupy sugar coating of the cesspool Poroshenko and the western capitalists have made in Ukraine, it’s sickening. Amazing timing, isn’t it? Trump gives Poroshenko the symbolic caviat to blast the Donbass to pieces again, Poroshenko declares martial law, and the creepy Nazi thinkers reemerge from the fascist locker. Allow me to paraphrase and condense some of what this Swedish kleptocrat who helped the Rothschild’s loot Yeltsin’s Russia asks the world to believe. And the wealthy oligarchs do not care about a reformation because, as always, they have no intention of abiding by any laws that loosen their grip on the Ukraine people. He goes on to insinuate for the four thousandth time, that Ukraine needs help to defend against Russian aggression. Aggression, indeed. News Georgia is fully armed with the Javelin systems the other day only amplifies the possibility of offensive moves along a broader front against Russia. While these Javelin deployments are billed as “defensive” in nature. The weapon’s capabilities are not so limited. The Javelin can be deployed in offensive situations that make it perfect for arming Kiev’s forces against the guerilla tactics of the Donbass defenders. The Javelin has secondary capabilities against helicopters and ground-fighting positions too, and its direct-attack capability will engage targets with overhead cover or in bunkers. As a harassing or “move and shoot” system, Javelin armed UKROP forces could create a real problem for the outmanned Donbass battalions. Reading a piece about the Javelin from Popular Mechanics, of all places, I was amaze at how transparent the U.S. role in all this is. Believe it or not, the venerable gadget magazine cites the son of the now deceased Russia hater, Zbigniew Brzezinski. When asked about the deployment of these new Javelin systems, Ian Brzezniski just spills the beans on America’s plans to retake the Donbass and Crimea. Brzezniski, who’s now a Senior Fellow at the Center on International Security, had the gall to rehash the Soviet Union’s Stinger missile problems in the war in Afghanistan his father helped orchestrate. Clearly, our leaders have learned nothing from the endless wars and crises of the last seventy years. We seem to keep installing the “clan” of warmongers tied at the hip to the military industrial complex and/or the profiteers bent on carving up Russia. Look at the implications. One of the most ruthless oligarchs in Ukraine has been issued a free pass to reignite the war in the Donbass. Anders Åslund, the man who alongside Jeffrey Sachs and David Lipton, paved the way for the massive profiteering in Russia during the Yeltsin years, he’s now playing cheerleader for a war to retake the Donbass and Crimea. In a worst-case, we’re looking at Ukraine becoming an outright dictatorship and a world war with Russia. And in a best-case scenario the Ukraine people can look forward to decades of indentured servitude, poverty, crime, and fear. Make no mistake about this, in places where the U.S. hegemony encroaches, citizens of those countries end up far worse off than before their “democratization.” Ukraine, once an emerging democracy with unlimited potential, has been transformed into a kill zone in between Russia and her enemies. This is war even if CNN does not report it, but very soon I expect the Donbass to me in the headlines. Watch out.